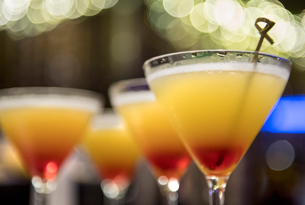 Maybe you’ve talked about it, or even tried your own dine-around on the Walt Disney World Resortmonorail with stops for cocktails, appetizers, dinner and dessert along the way. 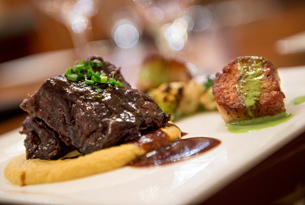 Now you can sit back and let us take care of the travel plans, making it easier than ever to experience this culinary journey around some of our favorite Disney resorts. 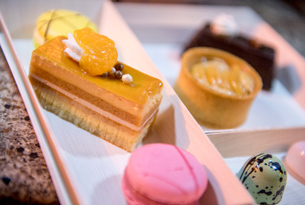 The new Highway in the Sky Dine-Around gives guests priority boarding on the monorail for an unparalleled dining journey around the circuit between Disney’s Grand Floridian Resort & Spa, Disney’s Polynesian Village Resort and Disney’s Contemporary Resort. You’ll start the journey by checking in at The Wave…of American Flavors at Disney’s Contemporary Resort for a welcome cocktail, then board the monorail to be whisked off to Disney’s Polynesian Resort to celebrate the spirit of the South Pacific with island-inspired sips and appetizers. Hop back on the monorail and head to Disney’s Grand Floridian Resort & Spa, stepping into the elegant hotel to enjoy a sumptuous entrée with wine pairing at award-winning Cítricos. After dinner, sip sparkling wine and sample artisanal cheese in the lavish lobby. 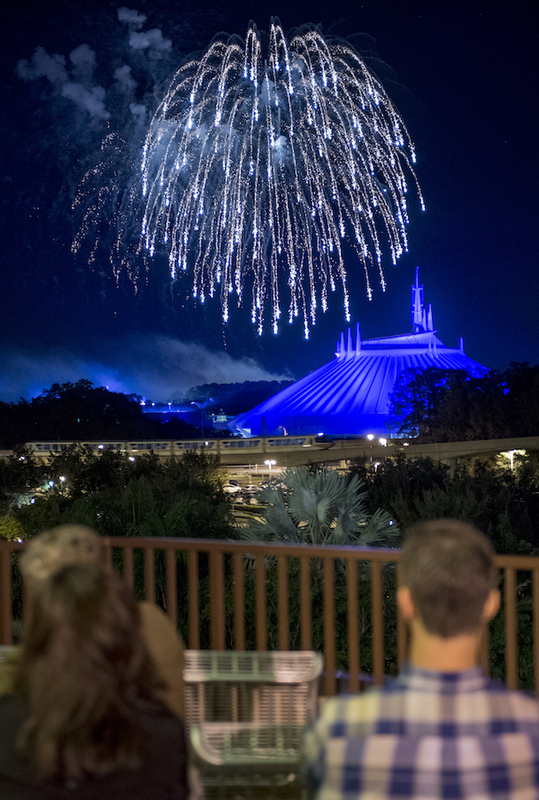 Then head back to the monorail for a final stop at Disney’s Contemporary Resort for dessert, cordials and coffee on a private patio with the Magic Kingdom Park fireworks over Cinderella Castle as your backdrop. Highway in the Sky Dine-Around is offered Tuesday, Friday and Sunday beginning Dec. 2. Reservations open Nov. 29. (No dine-around between Dec. 23 and Dec. 31). Cost is $150 gratuity included, tax is additional. Valet parking is included. For reservations, 407-WDW-DINE. Walt Disney Co.’s “Moana” sailed to a hit $81.1 million at the box office over the five-day holiday weekend. The estimated gross is the second-best five-day Thanksgiving opening of all time, behind Disney’s own “Frozen,” which opened to $93.6 million in 2013. Disney has come to dominate the Thanksgiving release window; “Moana” now means Disney has the top six five-day debuts for the holiday of all time. Thanksgiving week helps draw in multiple generations of moviegoers, said Dave Hollis, Disney’s executive vice president of distribution. “It gives us that big burst,” he said. “Frozen” became its own juggernaut in 2013, coasting on strong weekends for months to a domestic haul of $400 million. All entertainment for Holidays Around the World is included with regular park admission. Park hours are extended to 9:30 PM November 25 to December 24 2016, then until 10:30 PM from December 25 to December 30 2016. Performances take place daily from November 25 to December 30 2016 – check daily in the park for any changes to the schedule. With Peace on Earth Finale 9:30pm, from November 25 to December 24 2016, then 10:30pm from December 24 to December 30 2016. On Future World’s Fountain Stage, a five person a cappella group performs some of the holiday’s most beloved songs. 1pm, 2pm, 3pm, 4pm, 6pm. A unique blend of the soulful expressiveness of Gospel and Inspirational Music with the sounds of Jazz, R&B and Urban Music. 1:25pm, 2:25pm, 3:25pm, 4:25pm at the Fountain Stage in Future World. A joyous retelling of the Christmas story by a celebrity narrator accompanied by a 50-piece orchestra and a glorious mass choir. 5pm, 6:45pm, 8:15pm. Performances take place daily from November 25 to December 29 2016. Take a journey through seasons of holidays in Morocco, where celebrations are “the spice of life!” 12:45pm, 2pm, 2:50pm, 3:25pm, 5:15pm, 6:10pm, 7:25pm. Hear the fascinating story of the Daruma doll and the Japanese customs of the New Year! 12pm, 12:45pm, 1:45pm, 3pm, 4:30pm, 5:15pm, 6:10pm, 6:45pm. Meet the kind-hearted witch who arrives on the Eve of the Epiphany to grant gifts to good children. 1:40pm, 2:35pm, 3:30pm, 4:25pm, 5:45pm, 6:25pm, 7pm, 7:30pm. Listen as Helga tells the story of the first Christmas tree and the tale of her first Nutcracker. 1:40pm, 2:40pm, 3:40pm, 4:40pm, 5:25pm, 6:35pm, 7:35pm, 8:30pm. The colorful Chinese Lion Dance brings good fortune and happiness to all during the Lunar New Year and Lantern Festival. 12:30pm, 1:30pm, 2:30pm, 3:30pm, 4:40pm. Enjoy the season of joy and fun with Sigrid and Julenissen, the mischievous Christmas gnome. 11:15am, 12pm, 1:15pm, 2pm, 3pm, 3:45pm, 4:45pm, 5:45pm. Celebrate a Feliz Navidad and join in the color and excitement of the music, dances and traditions of a Holiday Fiesta! 12:30pm, 1:30pm, 2:30pm, 4pm, 5pm, 6pm. Whisper your Christmas wishes in Santa’s ear. Even Mrs. Claus will be here! 1:30pm, 3:30pm, 5:30pm, 7:30pm. Discover the traditions of Hanukkah, the story of the brave Maccabees and the miracle of the burning oil lamp. 12:15pm, 1pm, 1:45pm, 2:30pm, 3:15pm, 4pm, 4:45pm. Experience the spirit of Kwanzaa, a celebration of unity, creativity and pride. 12pm, 12:45pm, 1:30pm, 2:15pm, 3pm, 3:45pm, 4:30pm. Appearing in Dickens costumes, the Voices of Liberty a cappella group presents a special seasonal repertoire of holiday favorites. 11:45am, 12:30pm, 1:15pm, 2pm, 2:45pm, 3:30pm, 4:15pm. Walt Disney World has announced the dates for next year’s Epcot International Food & Wine Festival at Walt Disney World Resort. 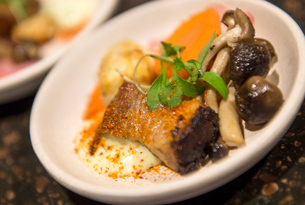 Mark your calendar: August 31 through November 13 will be a record 75 days of global culinary creations, celebrity chefs, premium events, Eat to the Beat concerts, and more. The long delayed Rivers of Light show may actually be ready for public viewing sometime soon. Cast Members at Disney’s Animal Kingdom are being invited to attend previews of the show this Sunday. Such previews are typically an indication that an opening to guests is imminent. There’s still no word on when the show will open to the public since its original Spring 2016 opening was delayed. Disney in August said Rivers of Light would open by year’s end. The company didn’t say this week whether that would still be the case. Park insiders say the show has been plagued by technical difficulties. Rivers of Light is a complex production, taking place on the water and featuring floating lanterns, lighting effects, live performers and music. New world-class attractions and experiences, including two new areas based on Frozen and Marvel, are part of a proposed multi-year expansion for Hong Kong Disneyland from 2018-2023. The Walt Disney Company and the Hong Kong Government are currently evaluating the proposal. “This proposed expansion brings the best of The Walt Disney Company to this wonderful tourist destination, giving guests an experience only Disney can deliver and infusing some of Disney’s most beloved characters and stories into this unique destination,” said Bob Chapek, chairman of Walt Disney Parks and Resorts. It all starts with one of the most popular Super Hero franchises in history. The Marvel universe will continue to grow even after Iron Man Experience – Hong Kong Disneyland’s first Marvel-themed ride – opens on January 11. A new Marvel-themed area will feature a reimagined Buzz Lightyear Astro Blasters and a thrilling attraction dedicated to one of the most popular Marvel franchises. An exciting new Frozen-themed land will come to life, allowing fans of all ages to experience the characters from the popular animated film in ways they never have before at a Disney park. Guests will enjoy new attractions and be immersed in the kingdom of Arendelle with uniquely themed dining, shopping, and entertainment. Sleeping Beauty Castle and the surrounding area will also be completely transformed to create the canvas for never-before-seen daytime and nighttime spectaculars and entertainment experiences, including a Bibbidi Bobbidi Boutique. Additionally, guests of all ages will be able to visit Moana’s Village Festival in Adventureland for a brand new daytime stage show. Guests will also have the opportunity to meet Moana from the Disney animated film that will be released globally beginning tomorrow. The Magic Kingdom will be offering another dessert party with parade viewing – Tiana’s Riverboat Party, debuting November 29th. This special event will be available for $49 per adult and $29 for children ages 9 and under (tax included). For reservations, you can book online or by calling (407) WDW-DINE or (407) 939-3463. Check in will be at the Liberty Square Riverboat entrance and will begin 45 minutes before the parade begins. The Riverboat will be closed to guests 2 hours before the parade begins, and for one after the parade. “Make the most of your next visit to Magic Kingdom park, where Princess Tiana and Prince Naveen are throwing an unforgettable party… and you’re invited! The occasion begins on the dock as your royal hosts welcome you and your sweet tooth to an ice cream social, complete with ice cream and toppings, drinks, and sweet treats. Then board the Liberty Square Riverboat and relax while enjoying the Disney Festival of Fantasy Parade—all from the comfort of your special viewing location! In a somewhat surprising move, Disney is now renting private cabanas in the Magic Kingdom’s Tomorrowland. The eight person cabanas will be tucked away near the old Skyway station beside Space Mountain and will be available to rent for $649 per day. Including shade, seating, drinks and snacks, and reserved viewing for parades and fireworks. The cabanas are actually small white tents, similar to those used to house the security scanners at the main entrance. The cabana concept has proven popular at the water parks and resort hotels, and if this test at the Magic Kingdom goes well, expect to see it rolled out to the other theme parks. Reservations open today for dates beginning November 27 2016. Call 407-WDW-PLAY to book. Disney announced today a brand new event at Walt Disney World Resort: the Epcot International Festival of the Arts debuts Jan. 13 – Feb. 20. It’ll be a trifecta of global masterpieces: combining visual, culinary and performing arts for six colorful weekends. From the art of Disney historical artist Mary Blair and Herb Ryman art of Epcot to current Disney artists Joe Kaminski and Costa Alavezos, you’ll not only be surrounded by incredible visions, you’ll watch the creative process live. Over the six weeks of the festival, guests will enjoy different pairings of phenomenal Broadway talent in concert singing the award-winning music of Disney on Broadway. Guests will be able to feast on creations that look almost too good to eat, but you won’t be able to resist our Food Studios. The Epcot International Festival of the Arts will run Fridays through Mondays, and unveil brand new art each week. During a D23: Destination D presentation today, Walt Disney Parks & Resorts Chairman Bob Chapek shared that, for the first time, Disney is adding a new adventure to the Star Tours – the Adventure Continues attraction. The new mission will be added to the attractions at Disneyland and Disney’s Hollywood Studios. Walt Disney Imagineering and Lucasfilm teams are currently in production to add an exciting new mission to the attraction based on elements from Star Wars Episode 8. Star Wars Episode 8 will be the second installment in the Star Wars sequel trilogy following Star Wars: The Force Awakens, due for release in December 2017. Walt Disney Imagineering has also released its first piece of concept art showing Star Wars Land at Disney’s Hollywood Studios. As you can see, the land will take on a whole new dimension after dark and feature adventures and surprises around each corner. 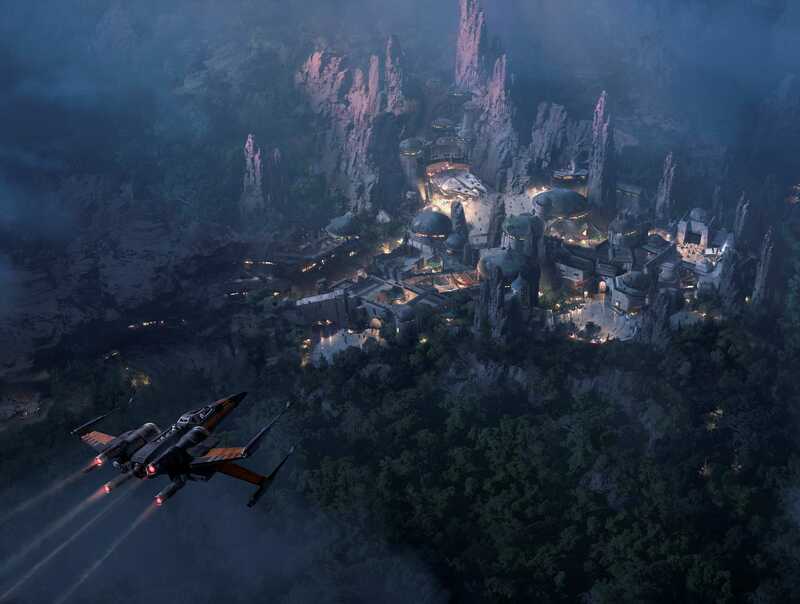 The image reveals a peek at what guests will discover in this all-new land located in the southwest corner of Disney’s Hollywood Studios, including one of the signature attractions that lets you take the controls of the Millennium Falcon.